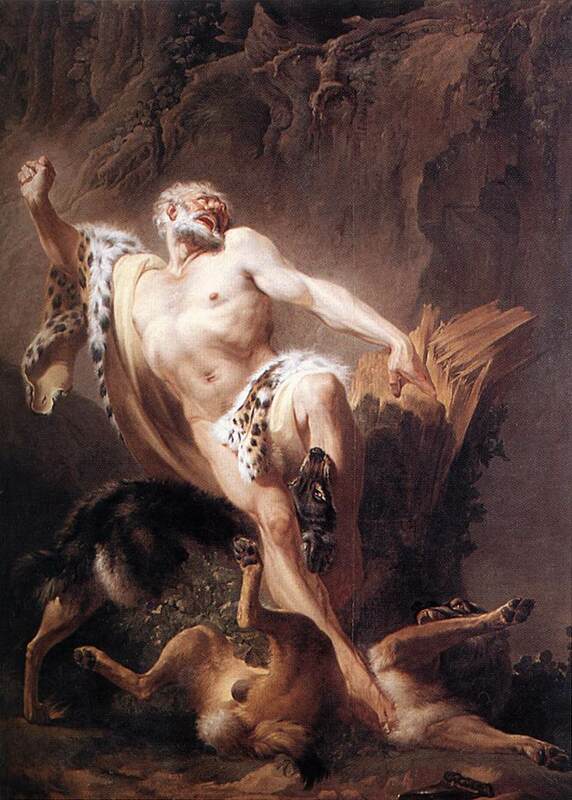 There are two central stories about Milo of Croton – the story of his training with the calf, and the story of his death by wolf attack. As I’ve searched the web for images of our man Milo to illustrate this website I’ve noticed a pattern. Artists appear much more interested in representing the story of Milo’s death than they are in the story of his training. 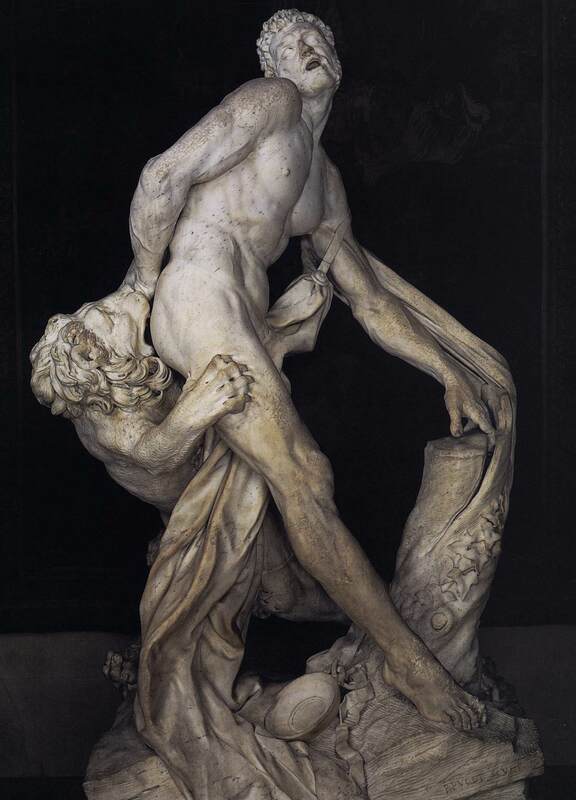 I’m no expert on art, and my research into this has so far been limited to the google, but it does seems to clear that the training which made Milo the greatest athlete in Greece is rarely depicted, while the overconfidence which caused his death has inspired a number of gorgeous sculptures and paintings. Painting by Joseph-Benoit Suvee, I wouldn’t mind having that kind of body in my old age. What to make of this? Is it simply that the struggle between man and animal is more visually stunning than the static image of a man with a calf on his back? Or are we more drawn to the story of Milo’s demise because of the lessons it teaches us about hubris and overreach, especially overreach in the face of nature’s power? It’s interesting to note that what gets Milo in trouble is thinking that he can rend a tree – that is he believes he is stronger than nature itself. When he cannot rend the tree, it is nature, personified in the wolves, which finish him off. You may be the greatest wrestler in history, but you’re no match for the natural world. 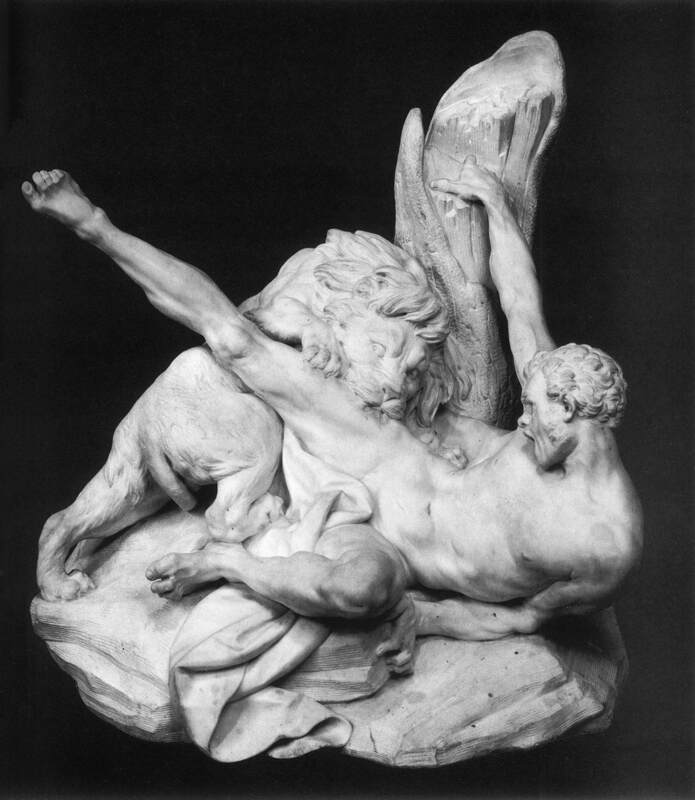 Sculpture by Alessandro Vittoria, notice how old Milo looks. Also worth paying attention to is how clearly Vittoria and Suvee portray Milo’s age. He is no longer the young man with the calf in these pictures. He is grey, old, even a little chubby in the Vittoria. Perhaps he is not as strong as he once was and, unable to face old age, he reaches for too much and pays the price. The Greeks loved bringing their heroes low. Heck there’s a whole genre of theater devoted to it. And, whether it is cheering for the underdog in a sporting event, or gleefully following the demise of Tom Cruise’s marriage, we too love seeing the mighty fall. Looking at this tendency in a positive light, it reinforces our belief that one should remain modest. Looking at it more darkly, it may be that we wish to punish those who have accomplished more than we have. Either way, in art, the hero who meets a tragic end seems to resonate more than the story of the long hours spent attaining that status in the first place. I’d rather it was the other way around, but I’m no artist. This is almost surely not a representation of Milo but rather a devotional offering left for Athena. That’s almost surely not Milo. 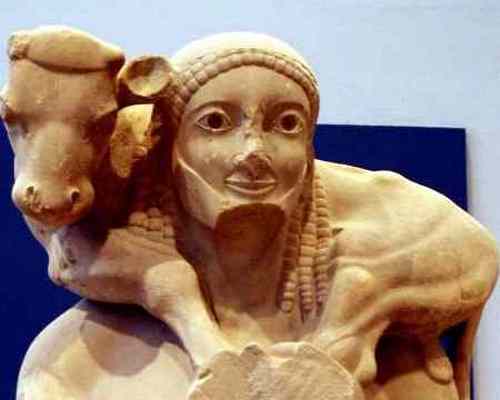 This summer I saw the original of this sculpture at the New Acropolis Museum in Athens. Recovered from the lower slopes of the Acropolis, it is most likely a devotional offering made to Athena. No mention of Milo is made on the description of the statute.